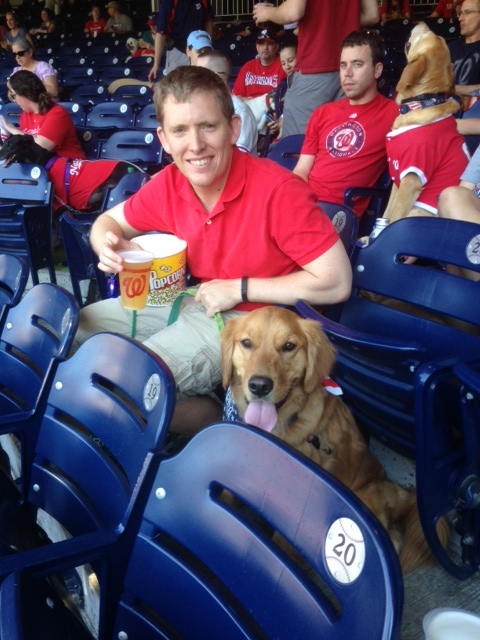 For the Washington Nationals, their ‘Pups in the Park’ games tickets partly benefit the Washington Humane Society. 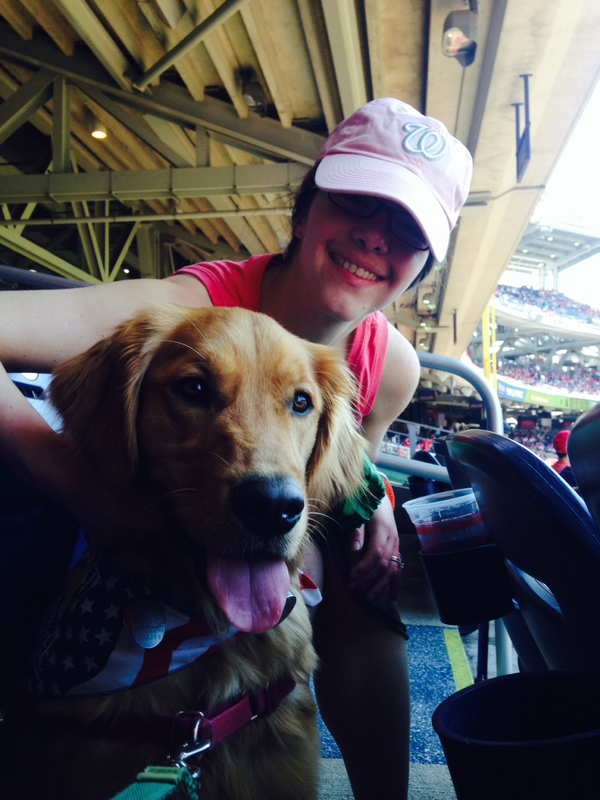 An adult ticket is $26 in the Outfield Reserved Section (Sections 140-143) and a dog ticket is $10. The dog actually gets a seat AND that ticket price goes to the Washington Humane Society. Waiting for the parade to begin! 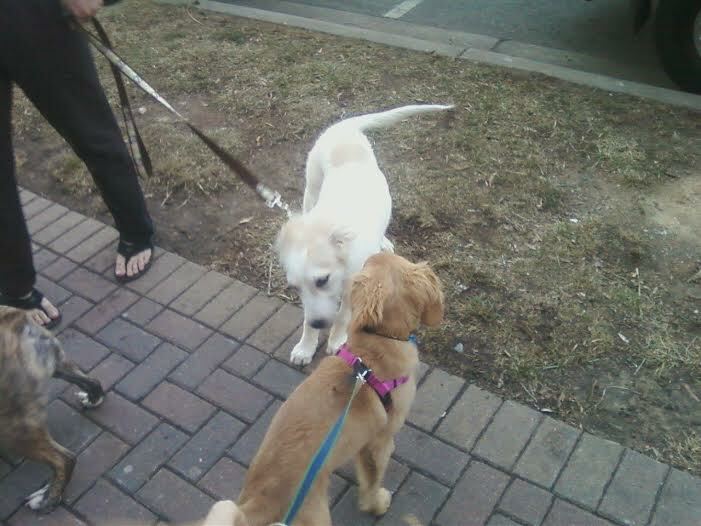 As the date got closer, I got a little nervous- Tucker gets along well with all dogs but he gets excited and pulls and I wasn’t sure what he would think. I didn’t want to stress him out any. We also learned that we could participate in a parade on the field prior to the game. So, my husband and I hatched out a plan to make this as organized as possible and as stress free as possible. We had previously bought a parking pass for a lot about a half mile from the stadium and decided to leave our apartment around 10:15 to make sure we were in line for the parade at 11:30. Now, on a good day we can get to that parking lot in about 10 minutes…on a bad day with traffic, it could take a lot longer. We brought water with us and I brought a bone in case he got bored. We hoped that we could make it to first pitch before he got too bored. 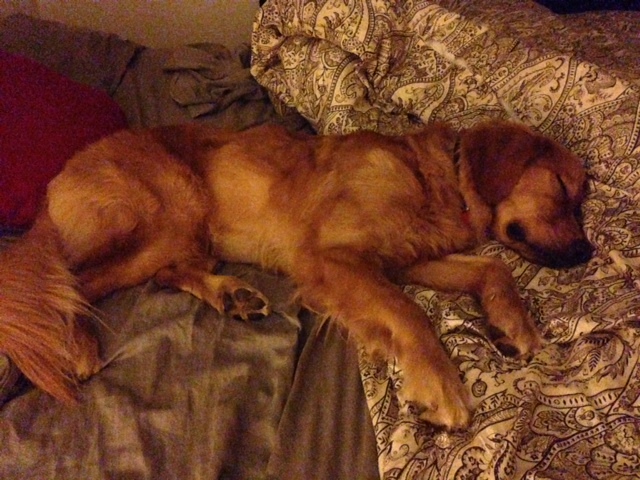 Oh, and we made sure he had plenty of exercise before we left so he would be a bit tired. The day arrived and it was a beautiful sunny day with a high of 80 degrees…in April. I had picked these tickets because I thought it might be the coolest weather. While it was warm, we lucked out with no humidity. We also lucked out with traffic and made it to our assigned parking lot in plenty of time. This worked out perfectly for us because Tucker is quite the puller when excited. Since we weren’t in a rush, we could make sure he stayed calm and didn’t pull as much. 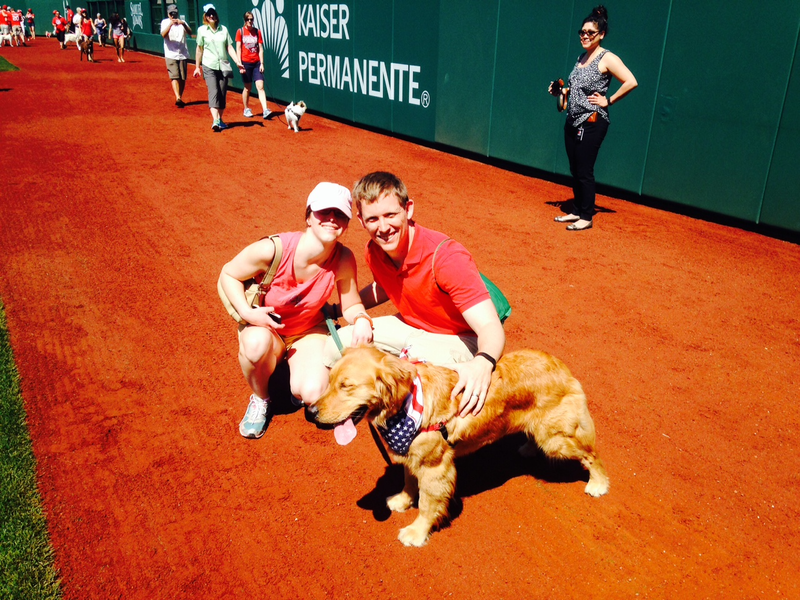 We got to the right-field gate and there was already a line of puppies and owners. We checked in (you have to bring a signed waiver and a vet record to participate) and got into line for the gates to open. Magically at 11, the gates opened and people and their pups started going through the metal detectors. Once through the metal director, we lined up in another line in the tunnel leading to the field. At this point, I was super excited, my husband was super excited, and Tucker was straight chilling. It was remarkable to see all these dogs there and they were all so well-behaved. At 11:30, they escorted us on the field and we got to walk around the whole field and take photos and videos. After that was done, they re-scanned our tickets and we were off to the Outfield! They had reserved a whole big area where the dogs could go complete with sod that the dogs could have a potty break on and plenty of water. There were also several picnic tables where we could relax in before going to our seats. Tucker was one of the first dogs on the sod and he peed quickly (repeated visits there led to no such further actions as I think he figured out it was fake..). We then sat down at a picnic table where we got some food and some beers and conversed with other owners and their pups. As the game grew closer, we found our seats. We were fortunate to not have anyone sit in our small row or in front of us so we could spread out. Tucker really wasn’t a fan of the seats and he preferred to either sit or stand in front of his seat, or sit on his Dad. However, many dogs were sitting in their seats (old pro’s!). Excuse Me, lady, do you have nachos you’d like to share? Got my seat right here! Remember how I said we had just hoped to make it to first pitch? Well we made it to first pitch and the first four innings before we decided everyone had a great day and it was time to go on to our next adventure (which was going to pick up more dog food!). 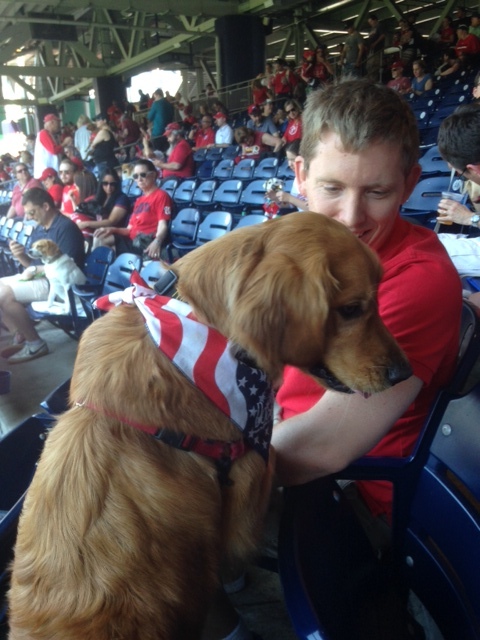 Tucker was exhausted but I could tell he had a great time–and it was fun being able to go to the game with him. I also want to note how wonderful the Washington Nationals staff was with this event. It could not have been planned or executed better in my mind. They have 5 more Pups in the Parks events planned for this season but tickets go fast- get yours NOW! Now I’m on to planning the next big adventure that I want to take Tucker on: THE BEACH! 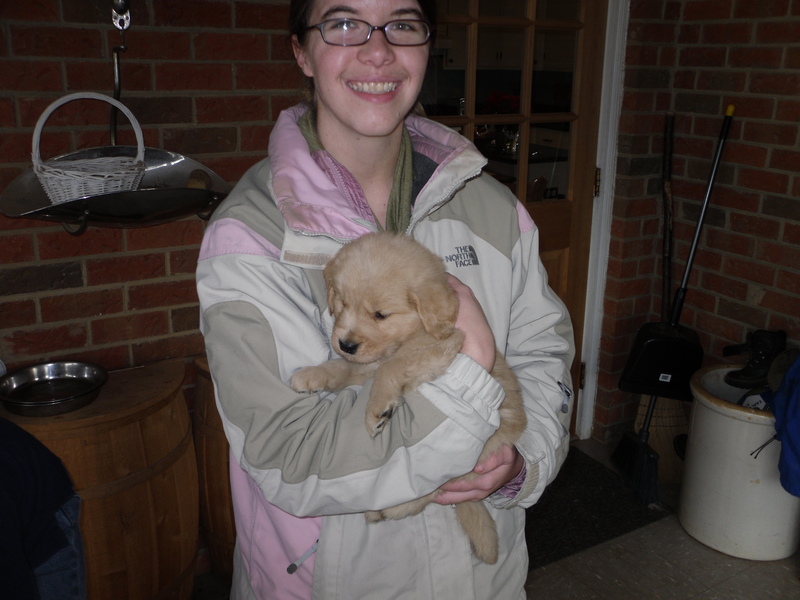 One of the best days ever: when we picked Tucker out! 1) Mornings are great: I have to say, I love my morning weekday and Sunday walks with him (my husband lets me sleep in on Saturdays while he goes running with Tucker or to the park with him). In the DC area, it is very busy and I constantly feel on the go. Before Tucker, I was never a morning person. I would get up about 30 minutes before I had to leave for work, eat breakfast, get ready and off to the Metro I went. Now I get up most weekday mornings at 6 or earlier so that Tucker and I have plenty of time to go out, come back in and eat our breakfasts and settle a bit before our morning walk. The mornings are mostly peaceful- fairly light traffic around the neighborhoods and most of the foot traffic is a few people getting an early metro or people with some of our favorite 4 legged friends. Not only is it great exercise for both of us, but it gets me prepared for the day at hand. When I have to travel or have to be somewhere early for work and my husband walks him, I often feel like I’ve missed out on something. Are there some mornings where I would rather just stay in bed? Absolutely…mostly on those rainy mornings where I have to balance an umbrella and a golden retriever. However, it’s probably my favorite walk of the day. Selfie on our morning walks. 2) Meeting people: I am an introvert. Once you get to know me, I open up and am silly and love to talk…but I generally shy away from big social settings. Having a golden retriever puppy, EVERYONE wants to pet your dog. We’ve met a lot of our neighbors and their dogs (I admit, I don’t know a lot of their names-its mostly ‘Fluffy’s mom, Bella Boo Bear’s Mom, etc) but there’s a sense of community that I didn’t feel before we got Tucker. 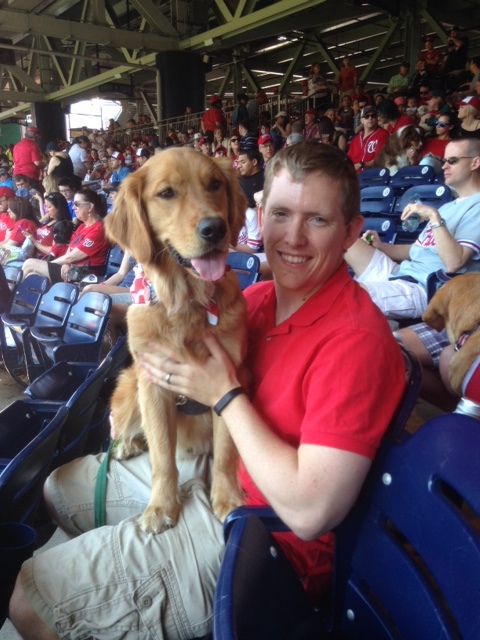 We take Tucker most places that we can–wineries, running races, dog friendly restaurants and our newest adventure yesterday: the Washington Nationals Pups in the Park event. 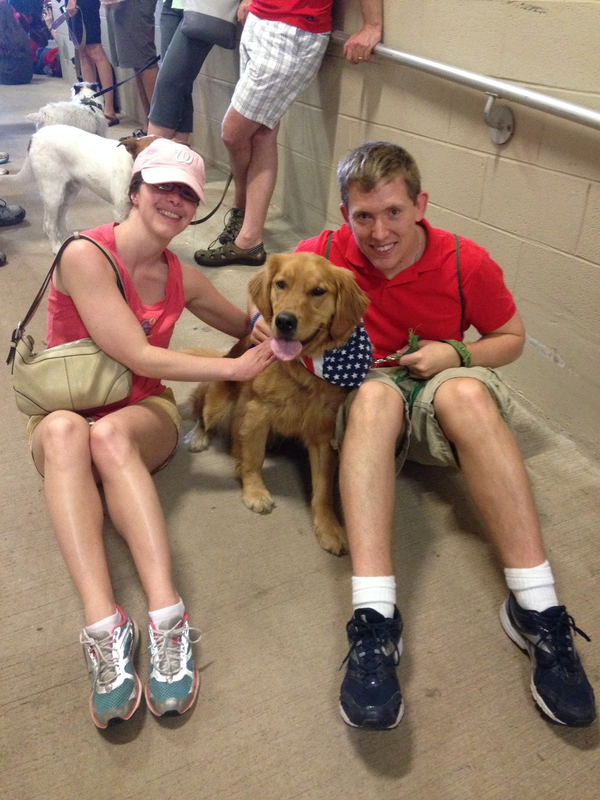 Yes, we took him to a baseball game–and he performed phenomenally well. Tucker is a conversation starter and that has helped me break the ice and has even helped me in situations when he isn’t with me. 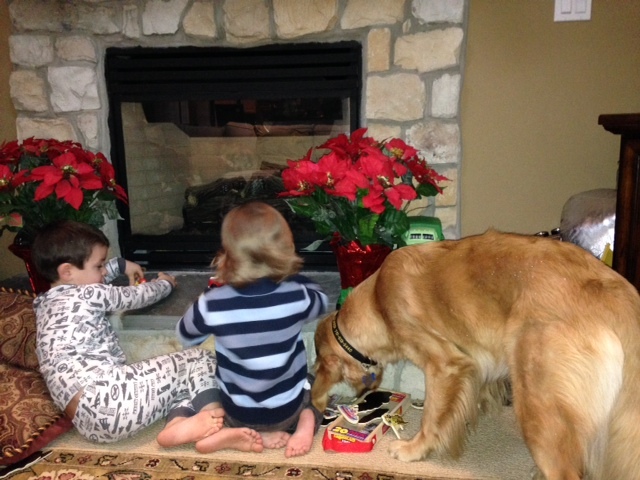 Tucker even has little human friends aka cousins he loves! 3) Partnerships are stronger and better: I’m an individual through and through. My husband doesn’t define me and I don’t define my husband. Prior to Tucker, my husband and I enjoyed doing things together, but many nights we might watch one things on TV and then go our separate ways- maybe me watching something in the bedroom, while he stayed out in the living room. Or we approached things differently. This may be a longer way of saying that we weren’t always a unified team. When Tucker came into our lives, we had to become a team- who took him out and when, who fed him and when, etc. When he’s gotten sick as sometimes our pups do, I’ve been a stressed out mess and Jason has been the balance. The calm in any storm. Not only does that help me but it helps Tucker too. This also leads to my second favorite walk: Family Walk. Every night after we’ve had our dinner, we walk Tucker around the neighborhoods for our nightly “family walk.” We talk about our day, what’s going on in the world, etc. I admit, the growing partnership hasn’t always been easy and there have been bumps in the road but there’s no one I’d rather do it with. 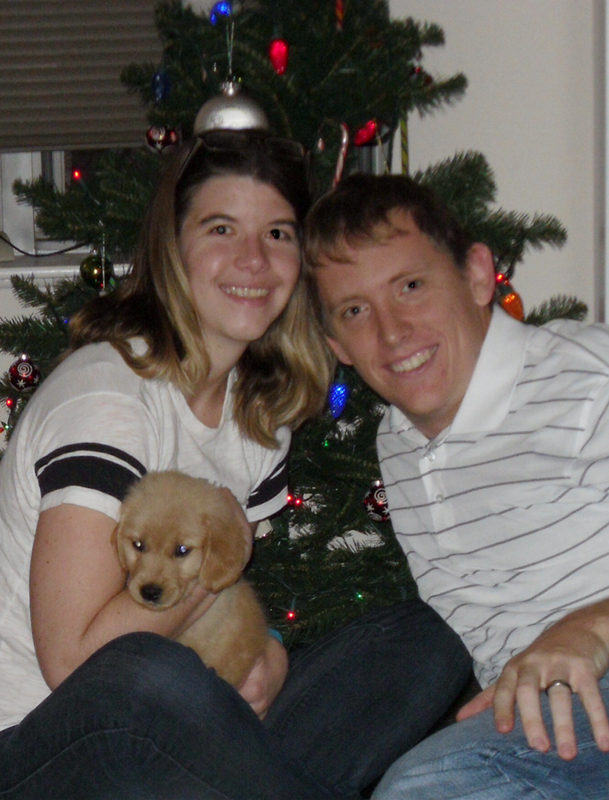 Our first night at home. December 2013. April 18, 2015. At Nats Park! 4) Persistence is key: This is not my favorite Tucker life lesson as sometimes it shows my weaker side with him, but he has taught me that sometimes if you really want something, persistence is key. This is where I sometimes Mommy fail. You know how they teach you in obedience that if your dog barks because he wants something, to ignore him? Easier said than done when you are trying to get something done and he’s barking for his special bone in the cabinet. I usually start strong- ignoring, making sure I don’t give in to his barking too soon, etc. Some days, he does just get it at the first bark. 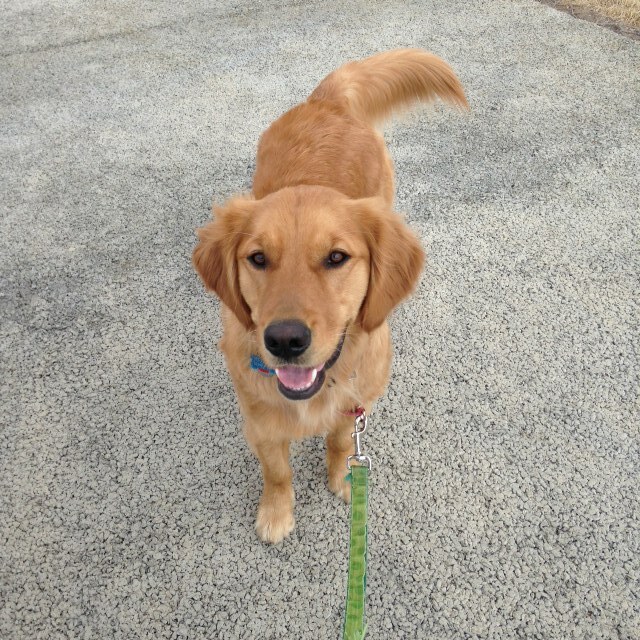 However, he has learned that if he is persistent, and barks but then behaves perfectly, he will get a reward. We’ll get there soon enough with the good behavior, but it takes persistence—–and sometimes a little bark. 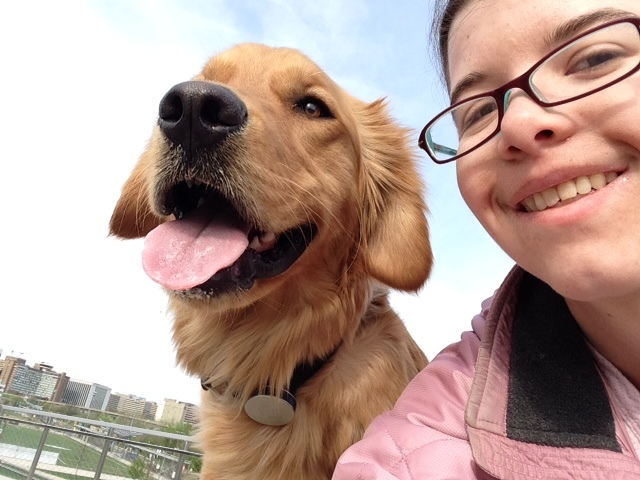 5) Life is for living, loving and smiling: I think this might be part of Tucker’s mantra. A woman walking her two small dogs the other day stopped me to tell me that Tucker was the happiest dog she’s seen. And he really is. He is frequently smiling and has an air about him that he loves life. The world can be a scary place-how often do we turn on the TV to see horrific news? Do yourself a favor–the next time life gets you down, turn ‘off’ (or mute if you can’t turn off completely) and play with your dog- or if you don’t have one, take a walk-chances are you will find a dog that wouldn’t mind another friend! I hope everyone is having a great start to their weekend. 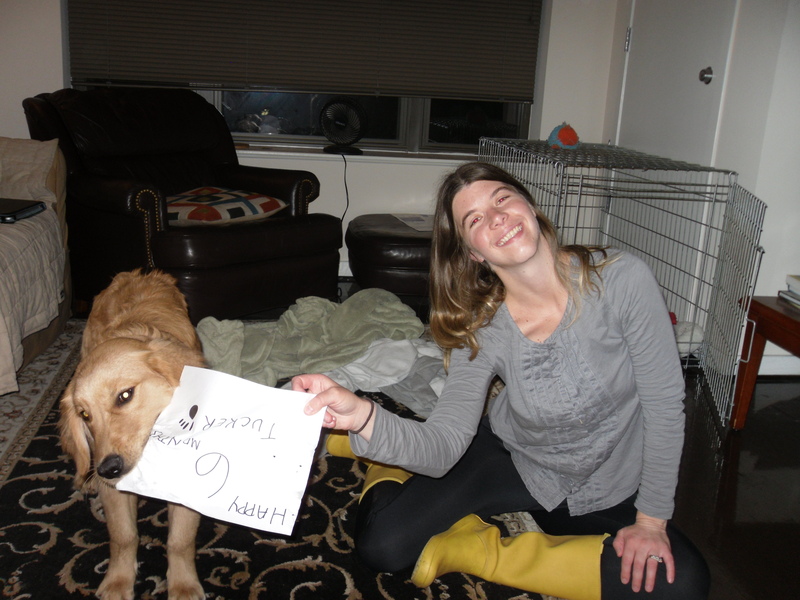 My second post for NoVADog Blog is out! 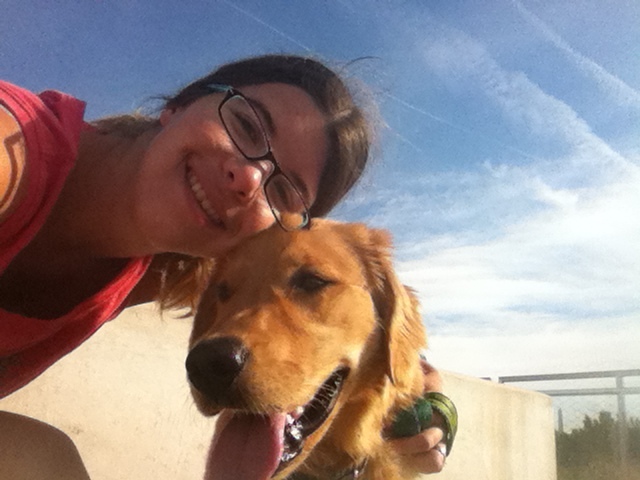 Please go here to check out a few places in the DC area where we like to walk Tucker. Also, please be sure to check the blog out for other informative articles like learning how to run with your dog and a training plan for starting to run with your dog from other guest bloggers. Tucker enjoying a Spring Day! Tucker has a playdate today with someone from Rover who may watch him when we’re on vacation this summer. We’re trying out these services (people host your dog–its almost like Match for your dogs) so if anyone has experience with them, please let me know! Tomorrow is Easter and you can bet your bottom dollar that I have an Easter Basket ready (or almost ready) for Tucker!